Marcus Harris endured a rough end to the summer. MARCUS Harris is learning how cutthroat international cricket can be after going from Ashes lock to fringe starter in a move that took even the best cricket minds in the country by surprise. 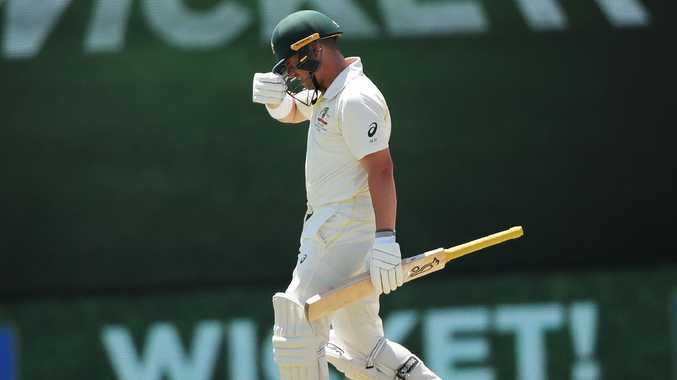 The opener, who made his Test debut in the first match of the summer in Adelaide, was the shining light in a dismal series against India that highlighted Australia's batting frailties when the suspended Steve Smith and David Warner aren't around to bail the side out. There were no centuries but Harris looked comfortable in his first international series, making a series of promising starts that convinced most judges he was ready for the step up from domestic cricket. In eight digs against the Indians he scored 258 runs at an average of 36.9 with two half centuries including a top score of 79 in Sydney. It was a solid output from a rookie and his presence at the crease led many to suggest he would be partnering Warner at the top of the order in England later this year. Harris thrived while fellow opener Aaron Finch struggled before eventually being dropped, and last month former captain Ricky Ponting picked the left-hander as one of just three certainties for the Ashes. 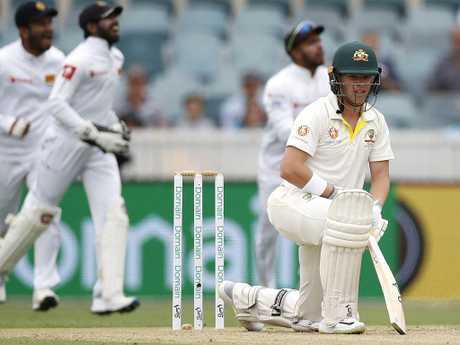 "Harris is (a lock), I've been really impressed with the way he's played," Ponting said during the Sydney Test.In Perth another ex-skipper Ian Chappell said: "He looked as though he felt like he should be out there playing at that level. He didn't appear to be overawed at all. Marcus Harris was advised to put away the cut shot. "For any cricketer, it's very important that you feel like you deserve to be on that level. If you don't have that feeling, you're going to struggle to succeed at the highest level. "He looks very composed and confident, but still played sensibly." 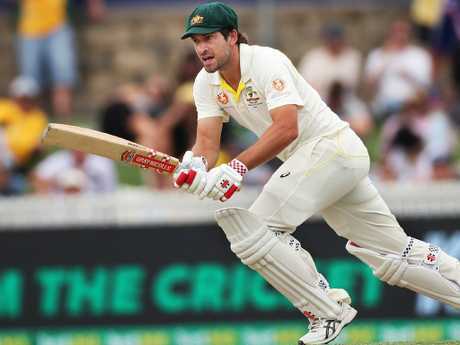 But a month later and Harris may find himself out of the starting XI by the time the first Ashes Test on August 1 rolls around after he failed to cash in against a weak Sri Lankan attack, while at the same time new opening partner Joe Burns flourished. Harris scored 44, 11 and 14 in the two Tests against Sri Lanka but it was the manner of his dismissals that was just as troubling as his low scores. In Brisbane, when a century beckoned, he hit a loose cut shot to point in the first over of day two and there was more ill-discipline in Canberra. He flayed at a full, wide ball he should have left in the first innings to again be caught at point and he was caught behind the wicket after outside edging another misjudged drive in the second innings. Harris’s decision making let him down. Aussie Test great Simon Katich said the three Big Bash League (BBL) games Harris played for the Melbourne Renegades between the Indian and Sri Lankan series looked to have interrupted his rhythm in the five-day format. "It just looks like he's gotten a bit out of sync since the Big Bash," Katich said during the second Test at Manuka Oval. "In Brisbane he got to 44 and looked OK but what was noticeable was he was looking to hit the ball a lot more than he has been throughout the summer. "Throughout those first few Tests against India he looked really disciplined in terms of letting the ball go and playing straight but then he had those few games for the Renegades and his whole batting rhythm looked different to how it had before in the Indian series. "I just wonder whether that has had an impact." Katich also questioned whether the mental drain that comes with playing Test cricket had taken its toll on the 26-year-old newcomer. "The other thing that shouldn't be underestimated is he's a young man making his way in Test cricket and there was a lot of hype around the Indian series and it is a long summer and it's tiring," Katich said. "He just looks like he's lost a little bit of sharpness that you need at the top of the order to be successful." Burns flourished while Harris floundered. That lapse has come at the worst possible time for Harris, who was overshadowed by Burns at the end of the summer. A sensational 180 in Canberra gave the Queenslander a fourth ton in 16 Tests and he's now taken the lead to be Warner's opening partner in the Ashes. 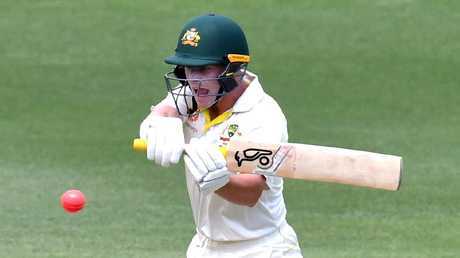 Australian legend and Fox Cricket commentator Michael Hussey said Burns had "cemented" his place in the side, along with Travis Head, who also showed he can match it at the top level. The South Australian had similar fortunes to Harris against India, scoring two fifties but failing to go on with his starts, before he slammed 84, 161 and 59 not out against Sri Lanka to all but guarantee a spot in the middle order, likely alongside Kurtis Patterson, who also scored a maiden Test hundred in the nation's capital. Veteran cricket writer Robert Craddock believes Harris is now the "most vulnerable" batsman in the Aussie line-up pushing for an Ashes starting spot. Craddock said Burns has to be on the plane to England and even threw up Matthew Renshaw as a possible contender. There are no Tests between now and the Ashes but Harris will still have a chance to push his long-form credentials in the final rounds of the Sheffield Shield. Each state has four more matches to play after the Big Bash ends and Harris can ensure he stays in the selectors' thoughts with a strong end to the season.